Portland, Oregon native, Cierra Ely, brings a wide scope of talent and design skills to the OUTinDesign team. Her domestic and international experience includes building operations and environmental sustainability. She has worked with building owners and operators to optimize energy and water efficiency across large portfolios of existing buildings. Due to her singular combination of both technical expertise and an innate eye for design, she spearheads OUTinDesign projects ranging from design-build to residential renovation to website redesign. An integral member of the creative design think tank, she executes plans and renderings from the design phase, expertly infusing brand and client essence into project concepts. Her multi-disciplinary abilities are essential to OUTinDesign’s holistic design process. Planted at a very young age, the design seedlings drove her to create scaled drawings of her bedroom with modular furniture cut-outs while other children played the latest video game. She received her Bachelor of Science in Architecture from the University of Minnesota in 2007 and her Master’s in Architecture from the University of Oregon. Cierra’s interest in environmental sustainability and architecture has been nourished by travel throughout Europe and Asia and living abroad in the Middle East. In 2011, she moved to the Washington, DC Metropolitan area. 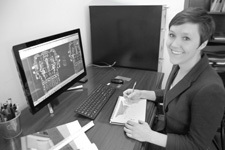 Cierra’s career spans Architecture, Interior design and Graphic Arts. At OUTinDesign, her creative and conceptual talents converged and facilitated her pursuit to find her true place within the design community.